“Home run!” is what APB’s baseball team kept hearing on the 26th of January. A score of 15 to 2. APB played Legacy High school, on their own field. This was quite an outstanding win for APB. The baseball team is built up of all grade levels, from 9th graders to even 12th graders. This was APB’s baseball team first win, they are currently 1-3. The team is currently coached by arc staff member, Ms. Miramontes. Ms. Miramontes has been coaching for several years, and has played the sport since she was around 5 years old. 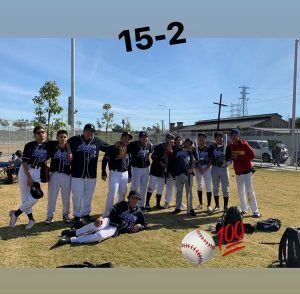 When interviewing junior, Bryan Castro about how he felt about the baseball game, he stated, “the other team was alright, but we played our game and it was pretty much easy. I feel they handed us a win.” Bryan has been part of the team since baseball began last year. Bryan also came across how he feels the team has progressed a lot overtime. The team’s daily routine consists of stretching, then running two laps around the field, then conditioning in catching/throwing, then practice playing a position, and end practice with a friendly game of baseball among each other. When interviewing senior, Benjamin Lopez, he said, “we played at our best, it was one of our top games. Everyone was hitting. It was pretty good.” Benjamin felt proud about this game, he felt proud of being one of the players who was able to hit the ball.